What is Sonocrystallization, how is it performed, and what are its uses? Discover how sonocrystallization works, its uses in industry, and the technology available to enable chemists to perform sonocrystallization chemistry. Sonocrystallization involves the application of ultrasound energy to control the nucleation and crystal growth of a crystallization process. It is a relatively modern technique (first reported in 1927) compared to traditional crystallization methods and enables nucleation at the lowest level of supersaturation where the crystallization overcomes the tendency of the compound to re-dissolve in the solution. Looking for an overview of the crystallization process? Discover our crystallization application page. Crystallization consists of two major events – nucleation and crystal growth – and the application of ultrasound energy in sonocrystallization chemistry impacts both events. 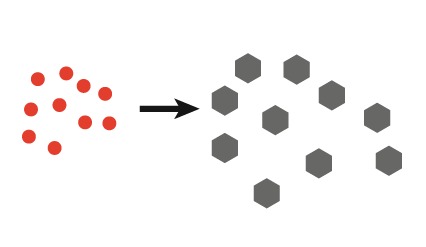 In nucleation, molecules gather together in clusters in a defined manner; these clusters need to be stable under current experimental conditions to reach the “critical cluster size” or they will redissolve, and it is this point in the crystallization process that defines the crystal structure. Ultrasound radiation is known to induce acoustic cavitation in liquids through the formation, growth, and collapse of bubbles. 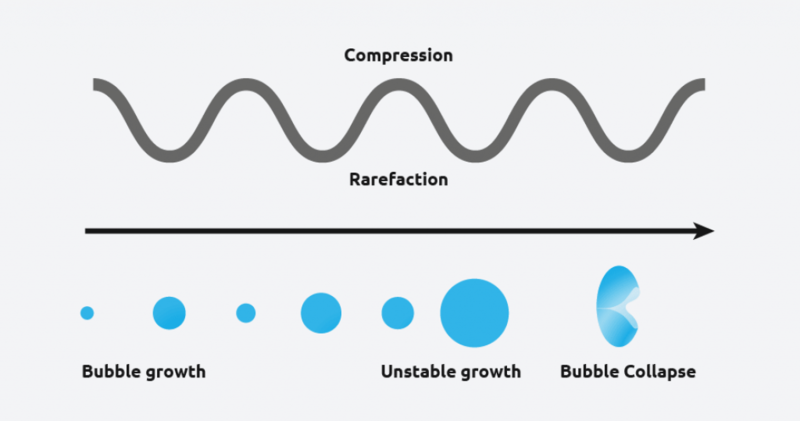 The collapse of the bubble provides energy to encourage the nucleation process at the earliest possible point in time. This results in highly repeatable and predictable crystallizations. In crystallization, the crystal growth phase occurs when nuclei that have successfully achieved the “critical cluster size” begin to increase in size. In sonocrystallization, ultrasound radiation is controlled during the crystal growth phase to determine the growth rate, size, and shape of the crystal structures. Crystal growth is a dynamic process, with atoms precipitating from solution and becoming redissolved. What are the benefits of sonocrystallization? Sonocrystallization provides many benefits over traditional crystallization methods (solvent evaporation, slow cooling, solvent/vapor diffusion, and sublimation). Ultrasound can induce crystallization over a range of supersaturation conditions and therefore potentially access a range of different physical forms. 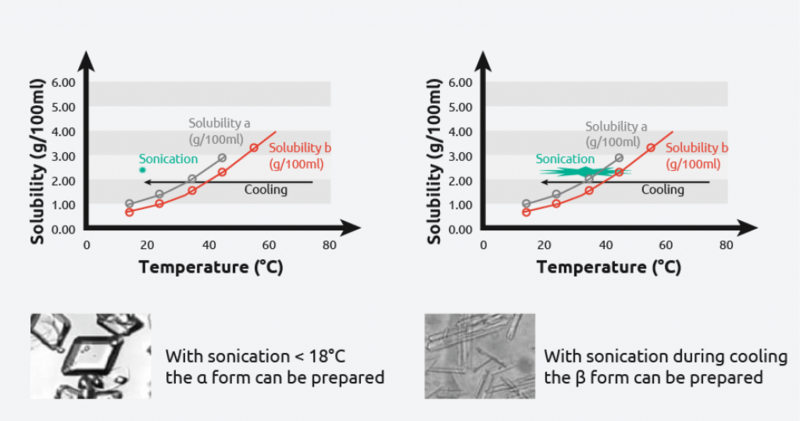 The key advantage to polymorph studies using sonocrystallization is reproducibility. Crystallization is one of the most widely used technologies in chemical industry, and process robustness governs process productivity and economics. In particular, the pharmaceutical and food sectors are utilizing crystallization for optimized separation, purification, and solid form selection. Using traditional crystallization methods, nucleation is random, and resultant crystallization processes are uncontrolled, leading to poorly performing API, and drug formulations. Many sonocrystallization studies have been driven by a desire to form monodisperse Active Pharmaceutical Ingredients (APIs), in the nanocrystalline range. 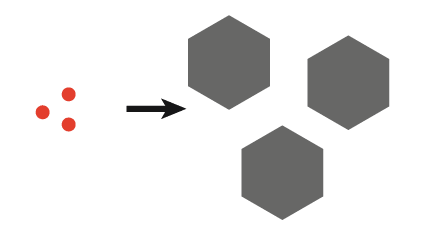 Nanocrystals tend to increase the bioavailability of APIs due to their increased surface area to volume ratio, and sonocrystallization offers a controllable and attractive method of accessing these crystals. Many pharmaceutical drugs have poor physiochemical profiles, such as poor solubility in biological fluids. Significant research and development efforts have been made towards developing a solid form landscape that covers all possible solid structures, including polymorphs, solvates, co-crystals, salts, and the amorphous phase to improve Active Pharmaceutical Ingredient (API) development. The ultrasonic probe is the common laboratory equipment for high-intensity insonation, allowing acoustic energy to be introduced directly into the chemical reactor system. 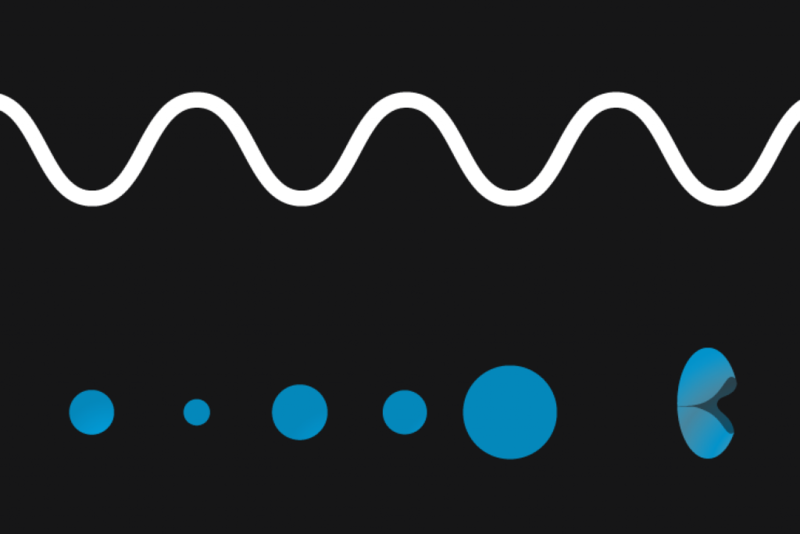 Ultrasound is known to create acoustic cavitation in liquids, however, when this cavitation happens near liquid-solid interfaces it behaves in a different way. The collapse of bubbles near the solid interface cannot occur in a symmetrical way, as the surface limits liquid movement from that side, meaning the majority of the liquid flows from the “solid-free” side. When a bubble collapses at the liquid-solid interface, it shoots a liquid jet towards the solid surface at greater than 100 m/s. This high-speed liquid jet, in conjunction with the shockwaves created by cavitation, is capable of causing pitting of surfaces, including the surface of ultrasound probes. 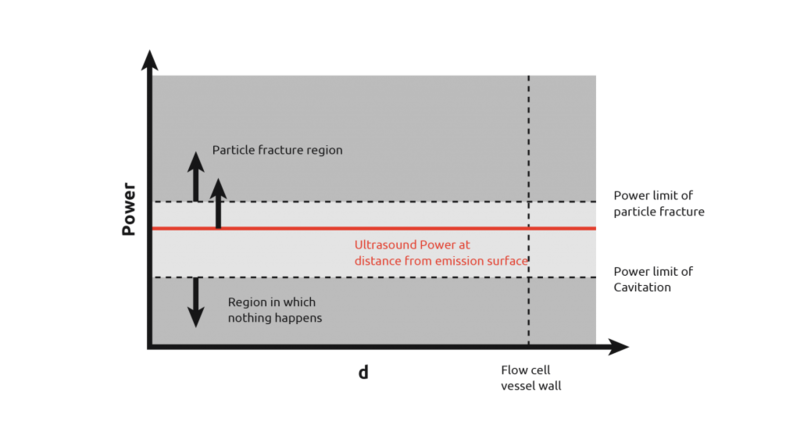 Ultrasonic probes also suffer from the inability to transmit the intense cavitation field more than a few centimeters beyond the probe tip, potentially leading to areas of insonation with a reactor. From the diagram to the right, it can be seen that if the probe is used in a vessel, then there is a wide power range seen by the contents. Due to the power discrepancy across the reactor, uniform and consistent results will be hard to achieve, with the exception of high power particle destruction. 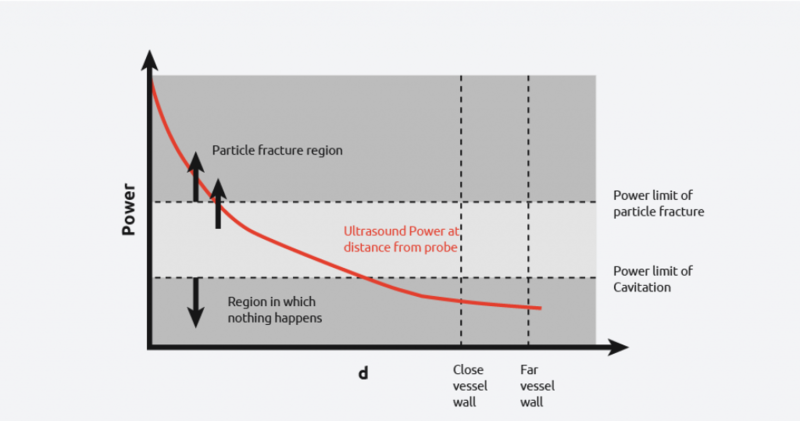 As the graph below shows, by increasing and reducing the power of the ultrasound, you still cannot get all the power to be within the desired range across the entire vessel. 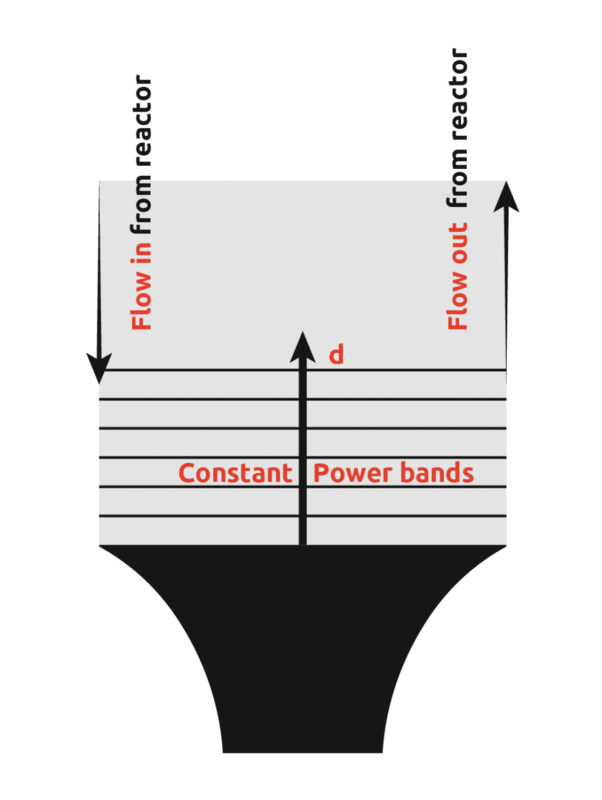 In an attempt to overcome this limitation of ultrasonic probes, many scientists have introduced ultrasonic probes into flow cells. This involves pumping the reactor contents to the flow cell, insonating to promote nucleation, and then pumping the flow cell contents back into the reactor to allow crystal growth. 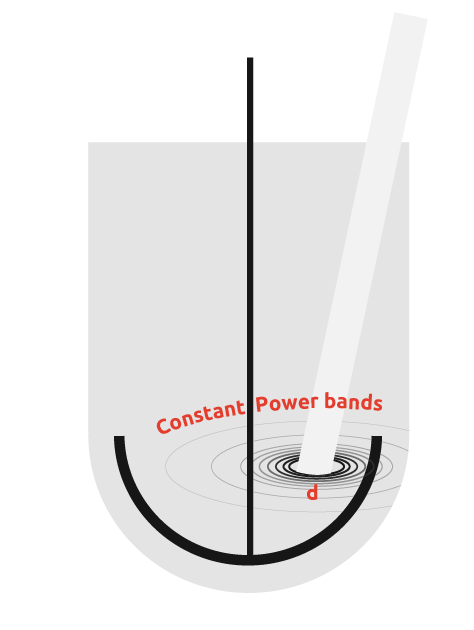 From the diagram, it can be seen that there is still a wide power range seen by the contents, however, uniformity of power seen is more consistent than in the first case. 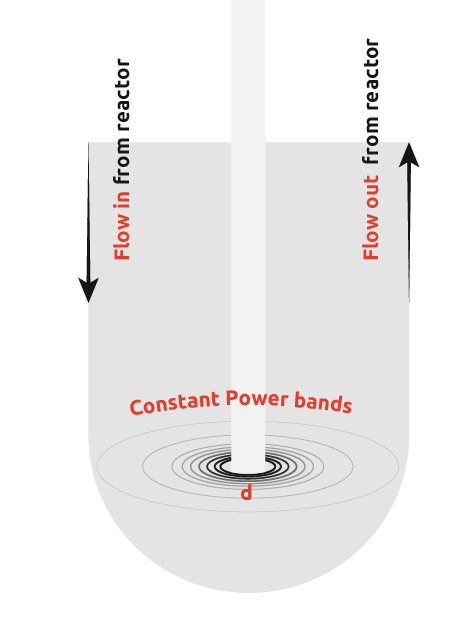 It is still not possible to get the power across the flow cell within the desired range as demonstrated by the graph below. 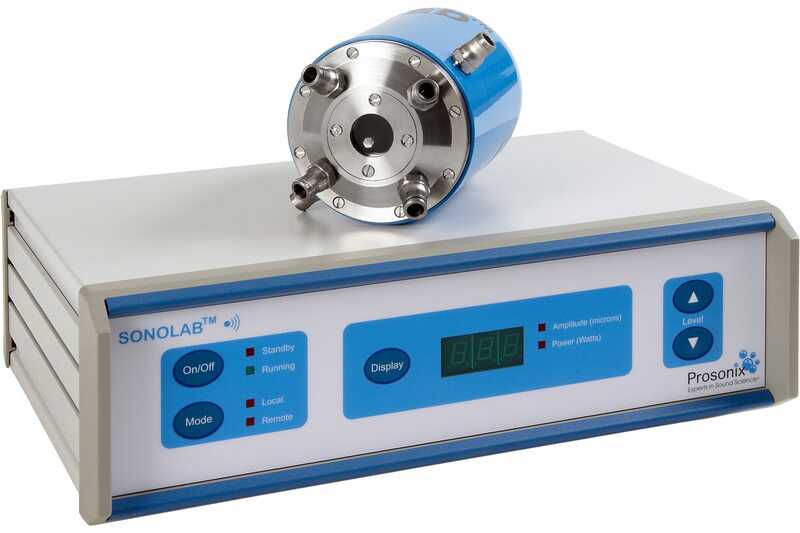 To overcome the limitations of traditional flow cell systems, ProSonix developed a proprietary ultrasound flow cell and ultrasound generator called “Sonolab SL10 Sonocrystallizer”. 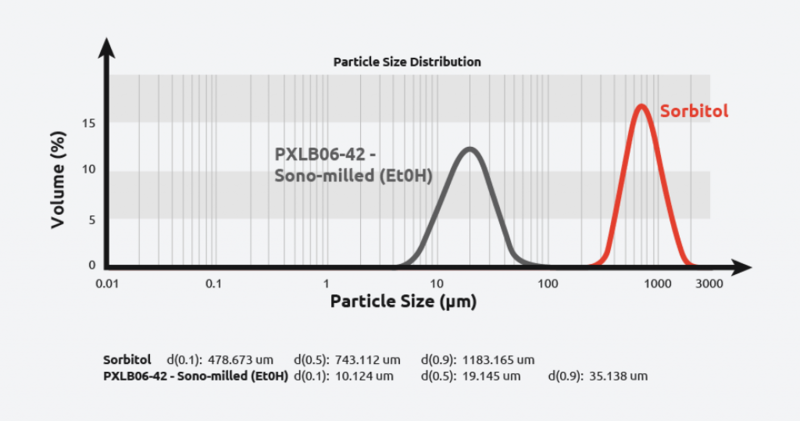 Using proprietary ultrasound technology, the Sonolab allows control of particle size, shape, crystallinity, and polymorphism in a completely automated and easy-to-use platform. 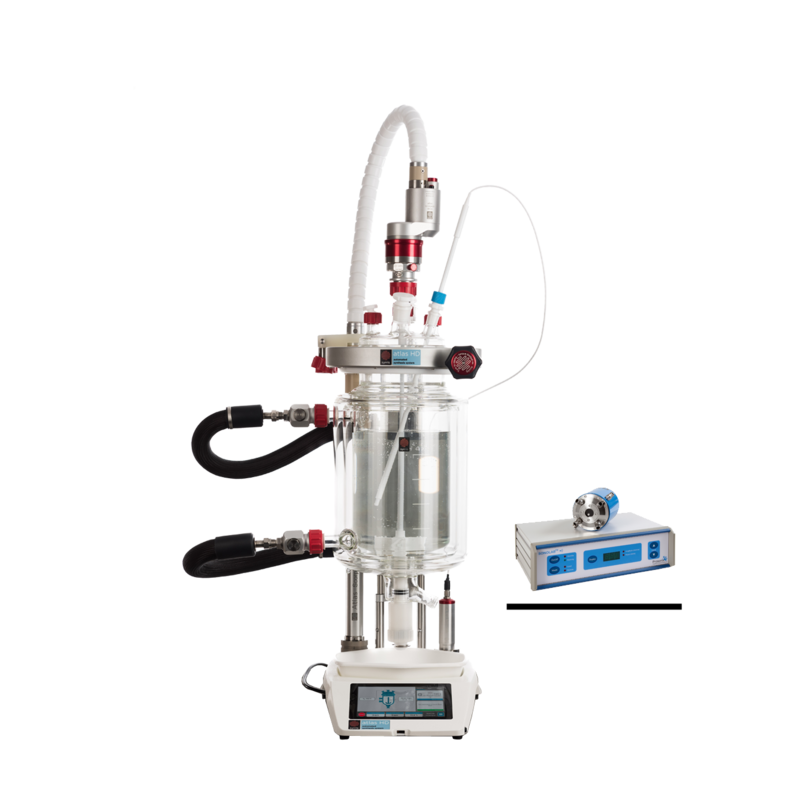 The Sonolab SL10 Sonocrystallizer module is a key component of the Atlas HD Crystallization system, a jacketed reactor platform that enables chemists to perform and monitor crystallization and sonocrystallization chemistry. Contact Syrris today to discuss your crystallization chemistry needs. What technology is available to help chemists perform crystallization monitoring and control? Chemists have a range of tools available to them for performing, monitoring, and controlling crystallization chemistry. Syrris systems offer a range of solutions to the problem of crystallization monitoring and control. Atlas HD Crystallization is an intelligent and automated jacketed reactor system that offers a turbidity probe for monitoring the crystallization process, and the innovative SonoLab module to perform sonocrystallization or sonomilling techniques. The system can also integrate a Lasentec FBRM probe for particle size analysis. Syrris products offer a range of solutions to the problem of crystallization control and monitoring. For more information about crystallization or how you can achieve better results using Syrris products, please contact us.